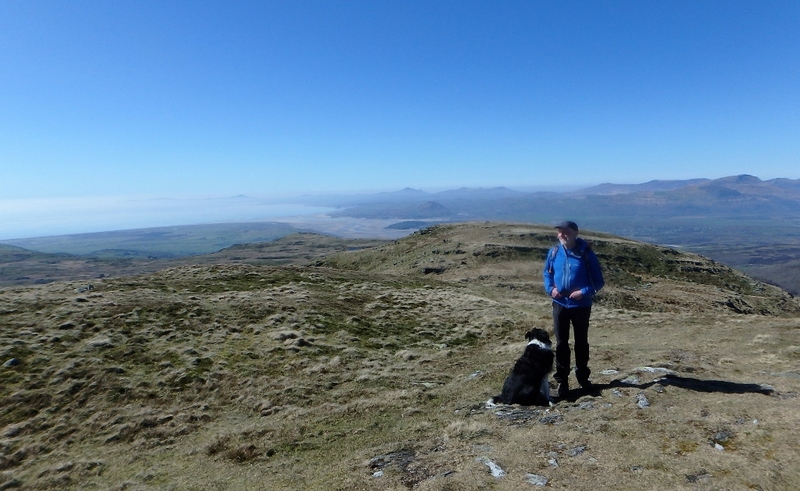 ← #220 – Foel Fras – Things don’t go as planned! 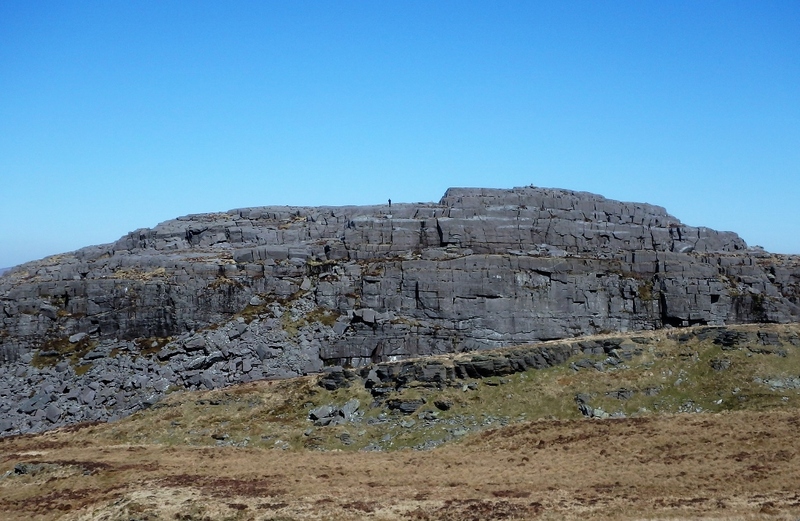 #221 – Moel Ysgyfarnogod in the Rhinogs. 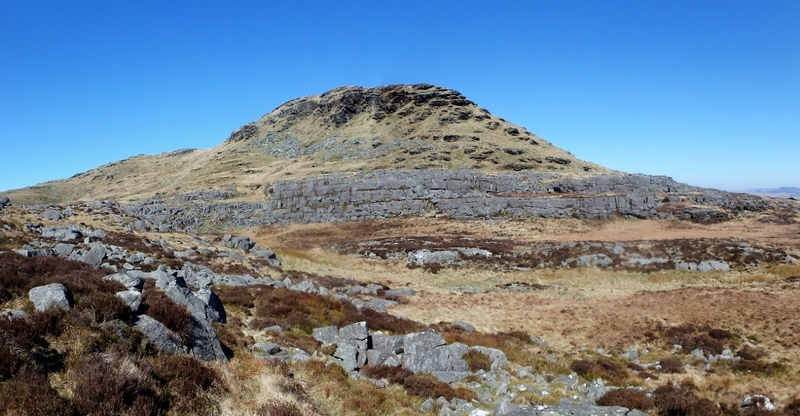 The Rhinogydd (Rhinog) mountains present some of the toughest walking in North Wales. 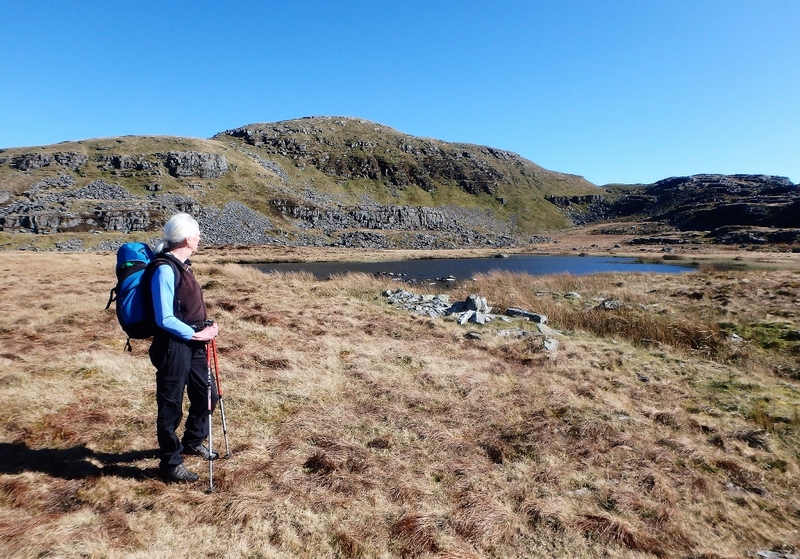 They may not have the highest summits but what the hills lack in height they make up for with miles of rough, stony, bouldery, heathery wilderness, with few tracks or paths – a good place to escape from the 21st Century then! We hadn’t been out this way for over four years (see posts #95 and #96), so a return trip was long overdue. 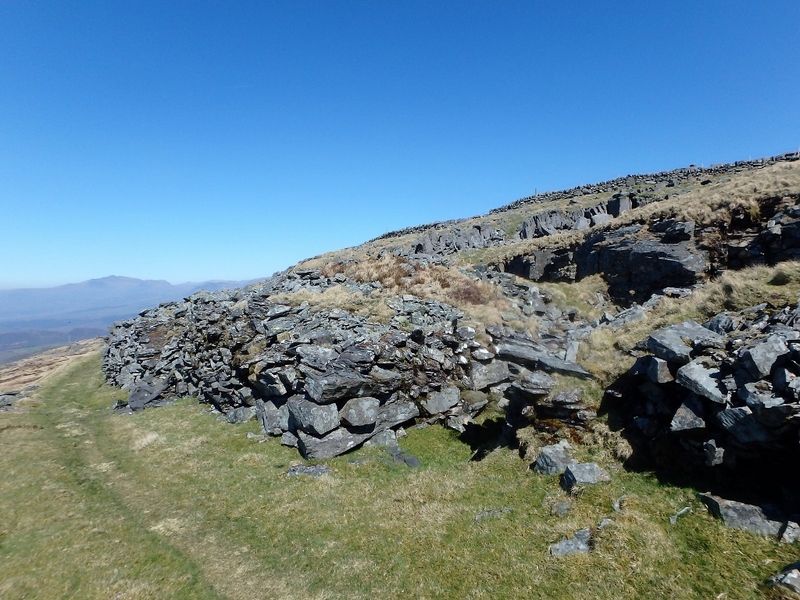 The name Rhinog comes from the word Rhiniog meaning threshold, and the Rhinogydd are just that, forming a barrier between the sea and the A470 road between Blaenau Ffestiniog and Dolgellau. 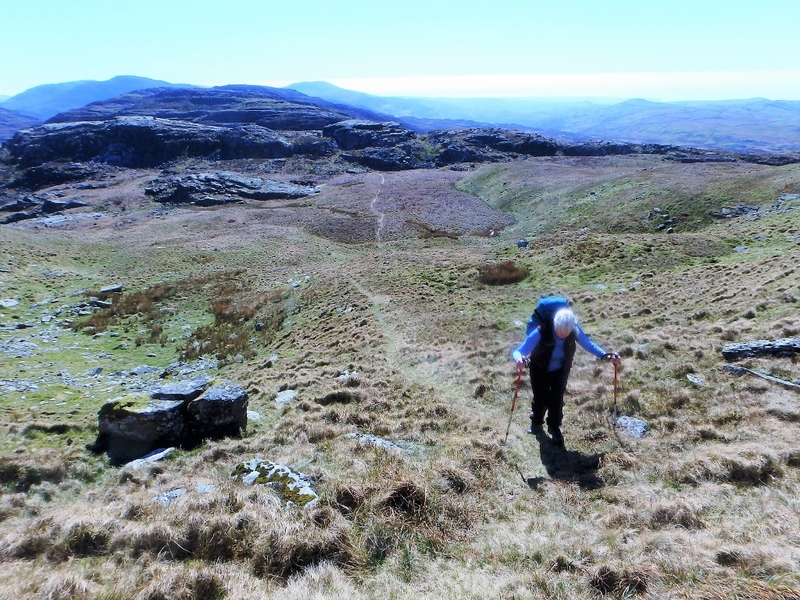 It’s gnarly terrain, not visited by the masses of tourists who head for Yr Wyddfa (Snowdon) and Tryfan, but there are ways through this challenging country, which is why Chris and I, plus Border Collie ‘Mist’, were heading towards Moel Ysgyfarnogod. 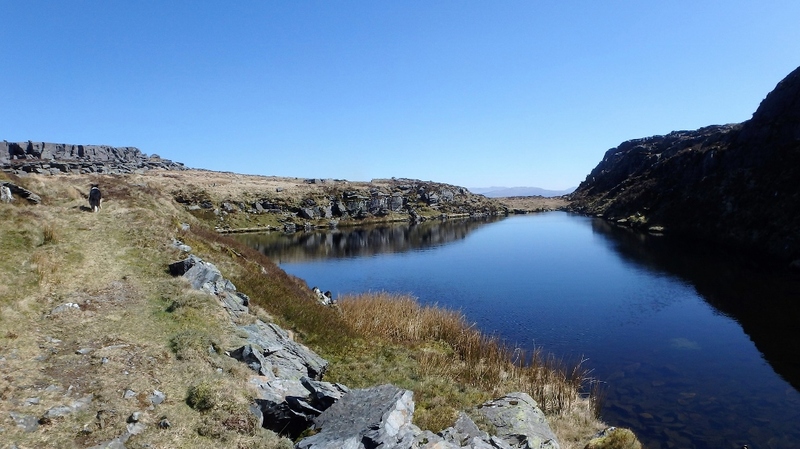 The first view of Llyn Eiddew Mawr, which translates as ‘Big Unchanged Lake’ …. The lane from Eisingrug to the start point is one of the narrowest lanes you could possibly take a vehicle, but with careful driving we arrived without any damage to the car or to my driver’s pride. 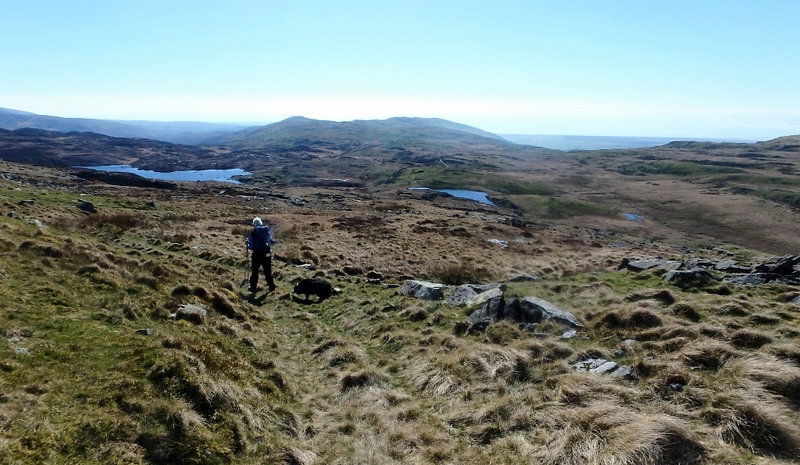 We then had a walk in of almost 5 kms to reach Moel Ysgyfarnogod, but the going was good on an old miners’ track. 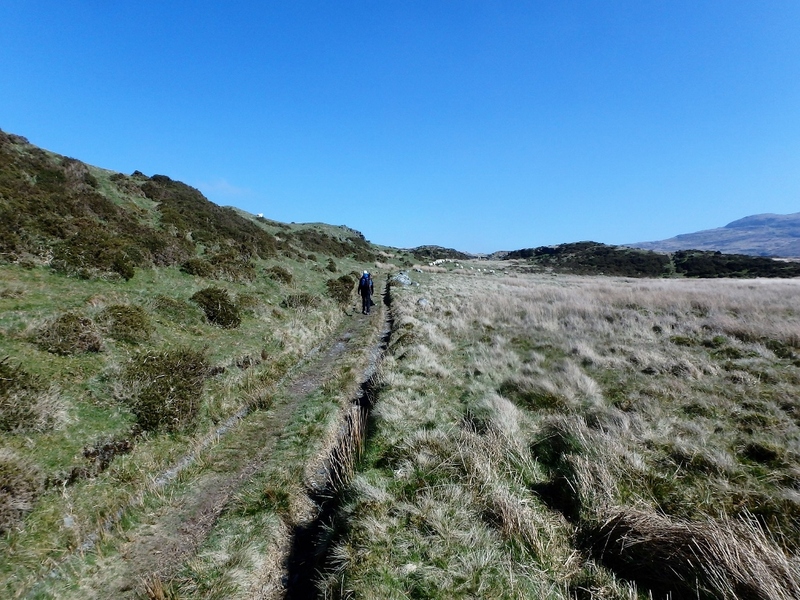 Along the way we passed the two Eiddew lakes before heading uphill to meet a terrace path running along the hillside. The terrace path continues …. Passing below the rocks seen in the previous view …. 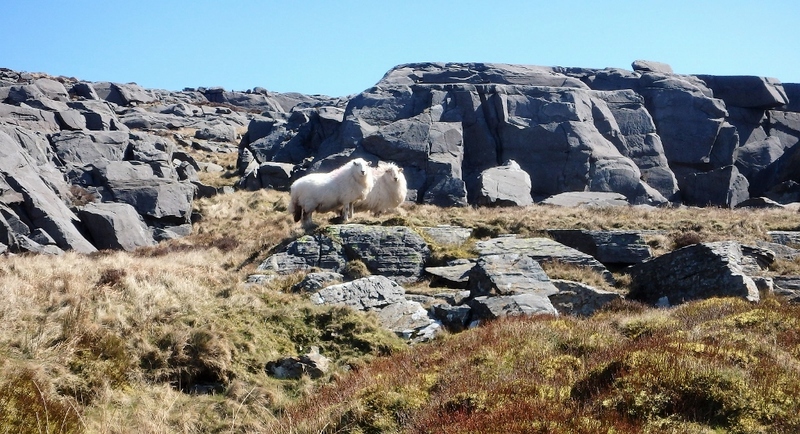 Local residents, looking very clean – probably due to the rainfall! The path is yet another old miners’ track (there must have been a lot of old miners hereabouts!) that takes advantage of a natural rising line which sits between rock walls above and a steep slope below – in places you could almost imagine being in the Dolomites. 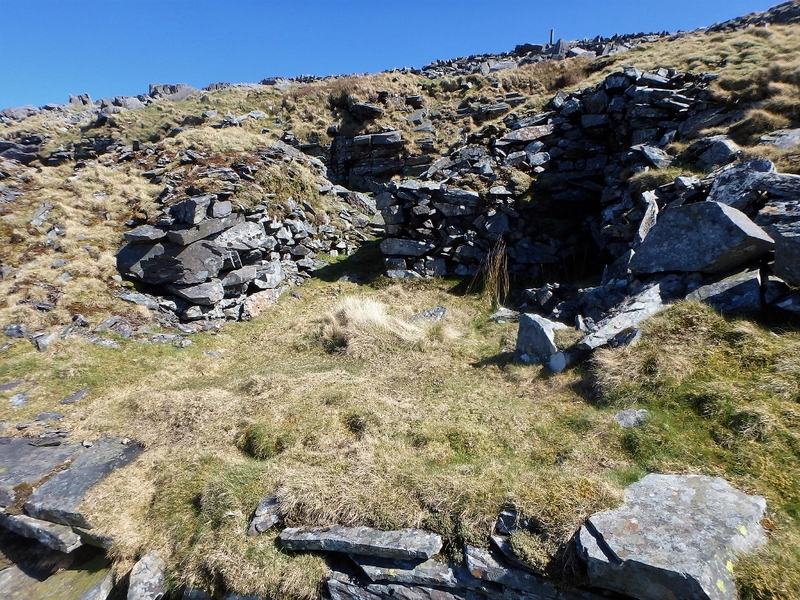 The remains of old mines were obvious at the start, and the views opened out as we gradually gained height. 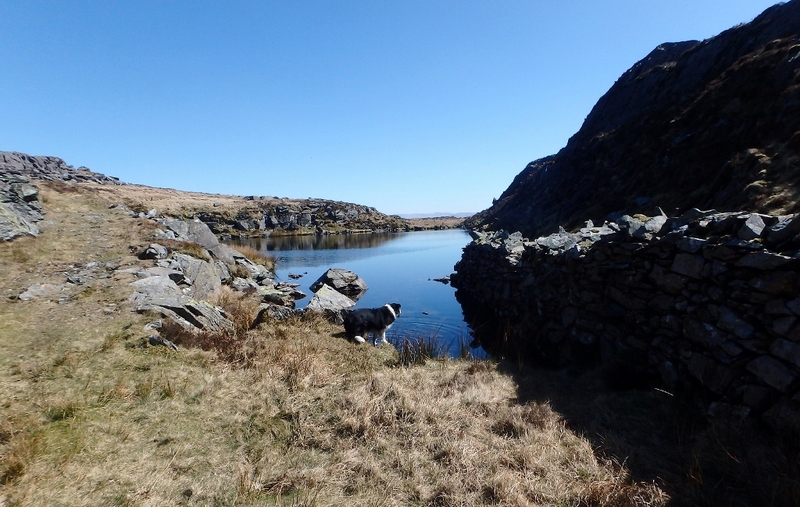 Border Collie ‘Mist’ at Llyn Du (Black Lake) …. …. but no time to loiter! 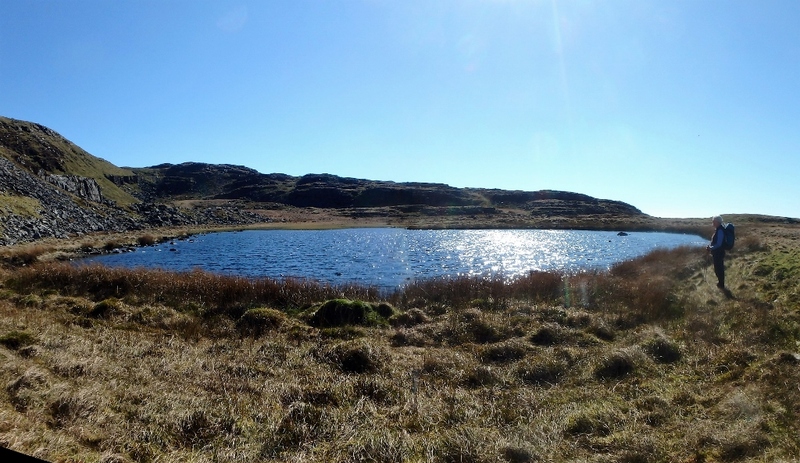 The terrace comes to an end where it bumps into the tiny lake of Llyn Du (Black Lake). It would make a brilliant campsite, but we were on a mission and didn’t loiter there too long. 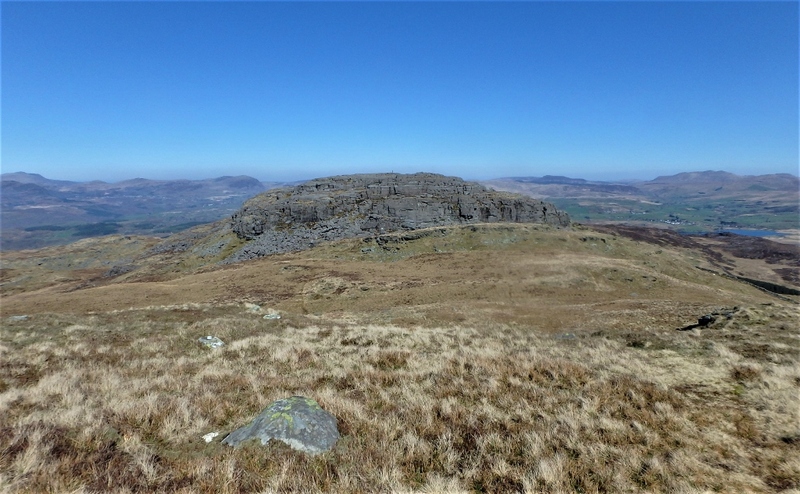 As we turned the corner of the ridge we had just traversed on the terrace path, the panorama opened up to the east and a little further on we had our first view of Moel Ysgyfarnogod and Foel Penolau. 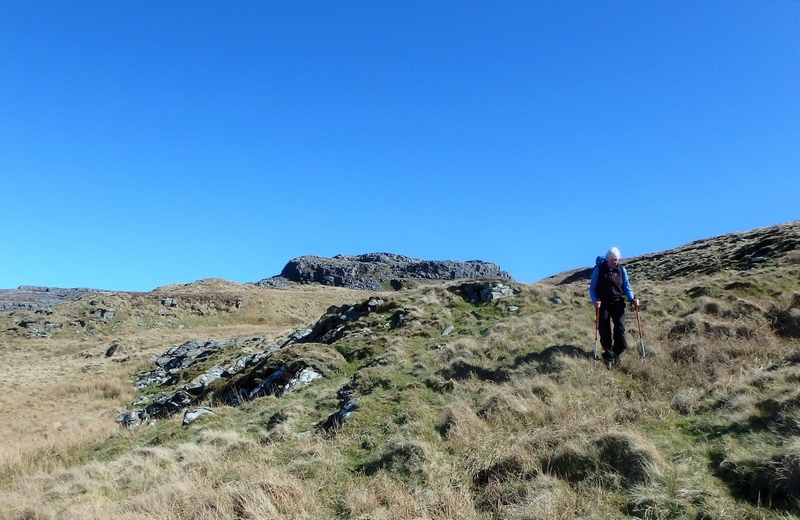 The last steep, bit to the summit …. Up to now it had been an easy day, with gradually rising paths, but on the slopes of Moel Ysgyfarnogod (Bare Hill of Hares) we had to start doing a bit of work on the first steep bit of the route. 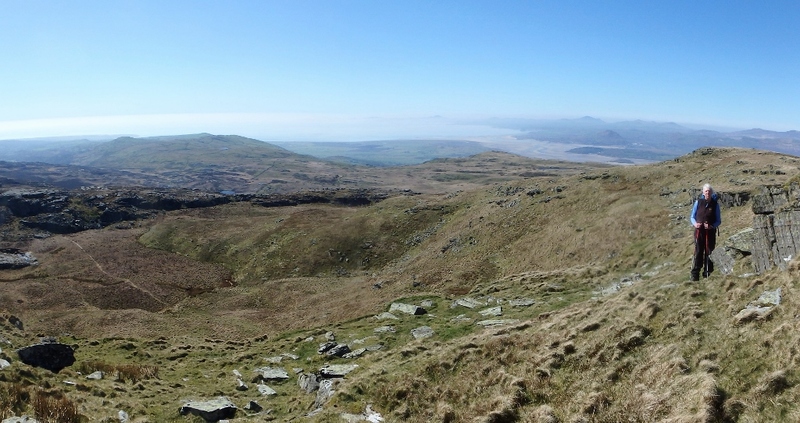 The summit gave great views to the north, including Snowdon and the hills around Moel Hebog, and to the west we could see the sea at Tremadog Bay. 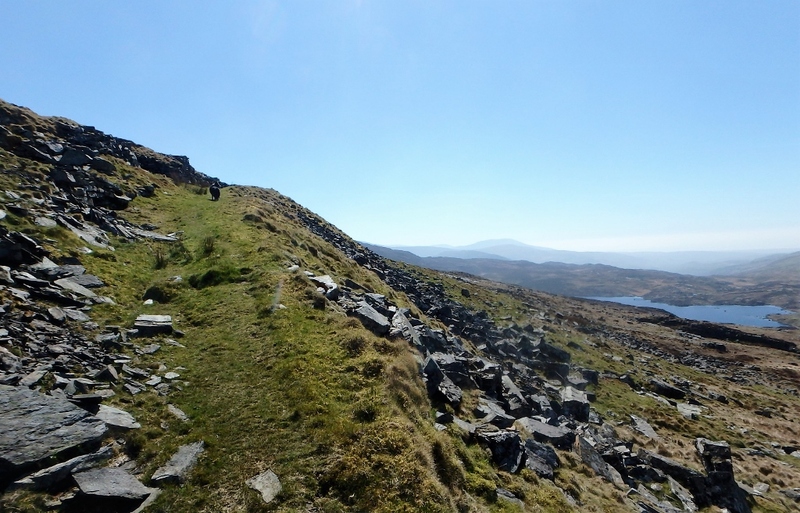 To the east was the edge of the lake of Llyn Trawsfynydd but looming up to the northeast was the neighbouring peak of Foel Penolau. 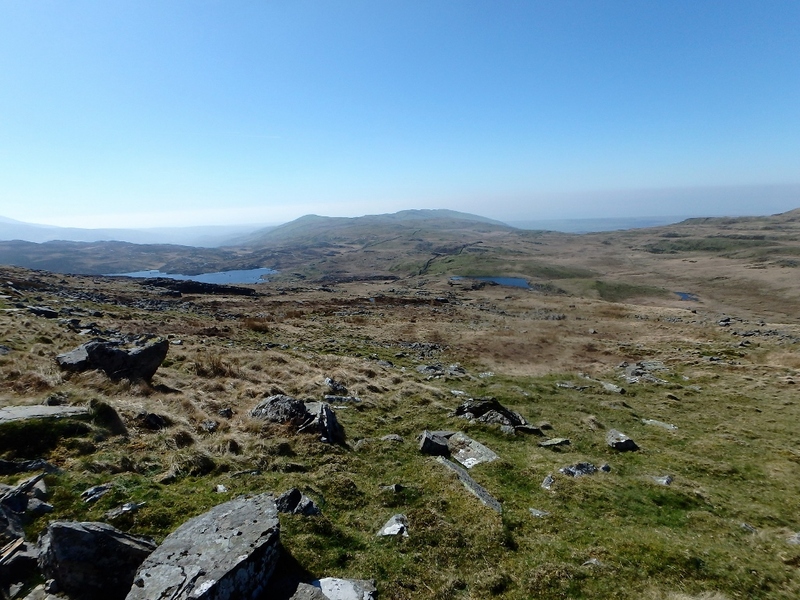 Foel Penolau (Bare Hill with a Light Top) is one of those mountains that demands a bit of commitment, as the sides are comprised of rocky crags with few breaks in their defences. This is definitely not what Chris would regard as a fun way to spend an afternoon, but it made a good recce for a return trip by me in the near future. 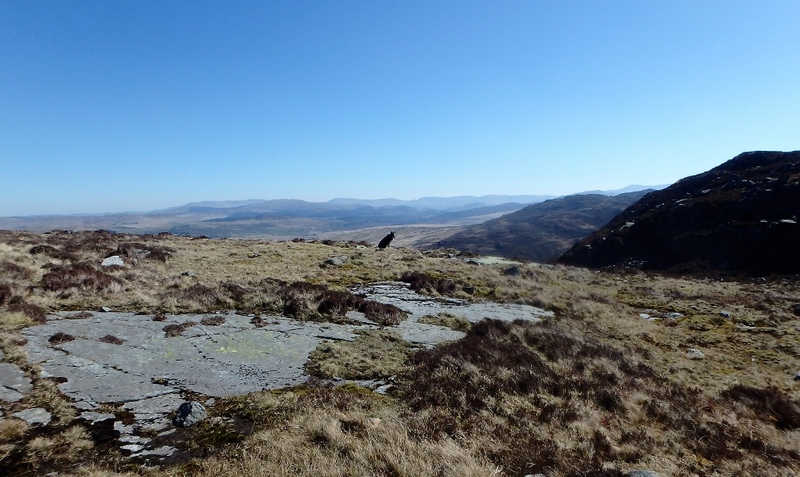 The photo shows a tiny figure on the skyline, giving an idea of the scale – I’ll be back for that one! Heading northwest on the way back …. The descent was a bit of a trackless ‘mooch around’, where the ability to read the ground was more important than reading a map, but before long we were at yet another lake, Llyn Dywarchen (Turf Lake or Sod Lake) – from here it was an easy job to re-join the miners’ track we had taken on the way out. These remote, rough hills may be ignored by the masses, but for lovers of solitude and quiet they are hard to beat. This entry was posted in 5. 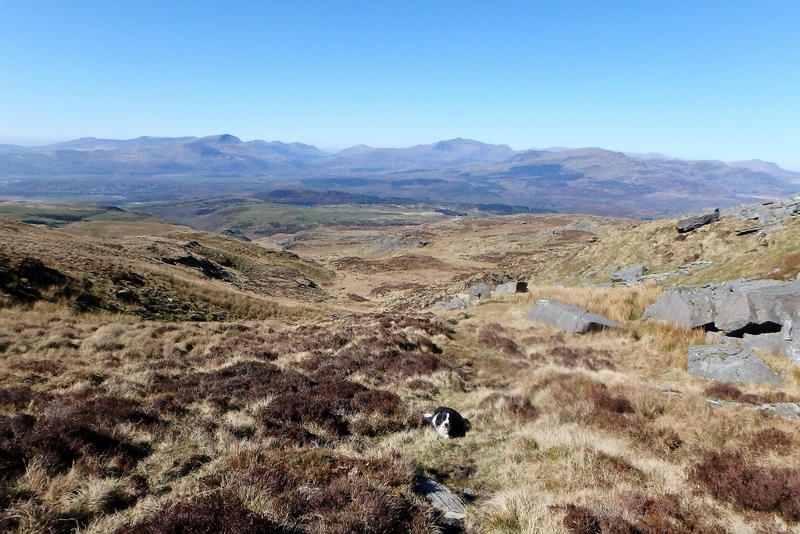 North Wales and tagged Border Collie, hillwalking, mountains, photography, Rhinogs, Snowdonia. Bookmark the permalink. 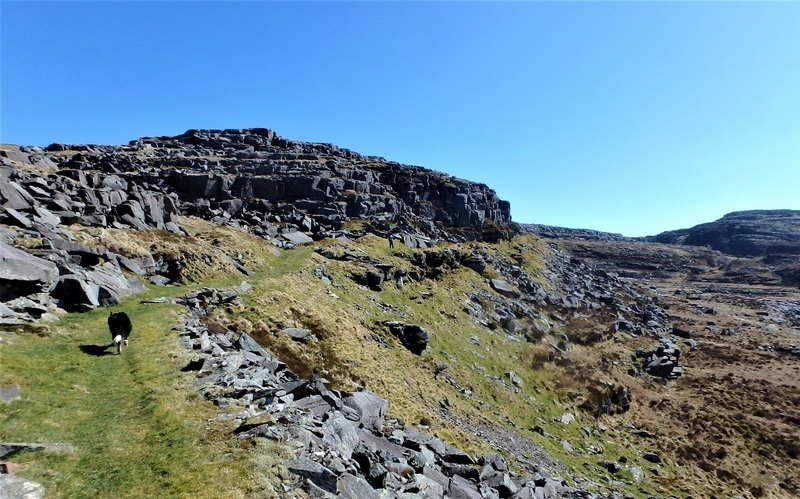 8 Responses to #221 – Moel Ysgyfarnogod in the Rhinogs. Good post. 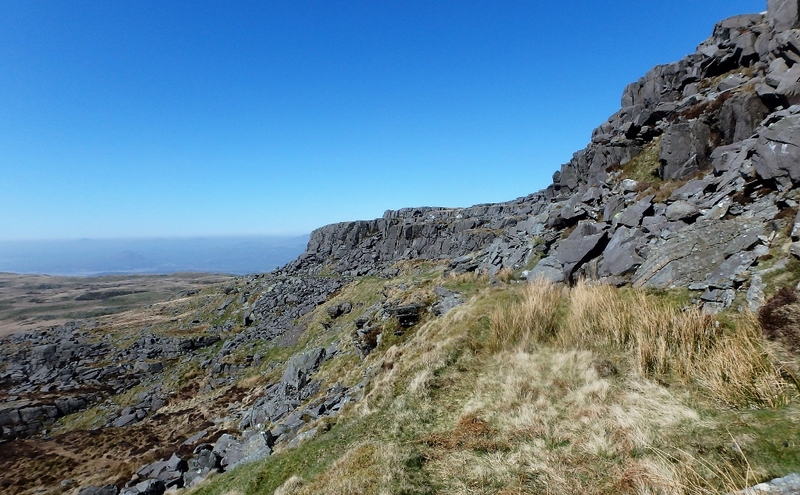 I’m planning a full traverse of the Rhinogs in July and from everything I’m reading at the moment, it doesn’t look like it’s going to be easy! Cheers for the comment Mark. 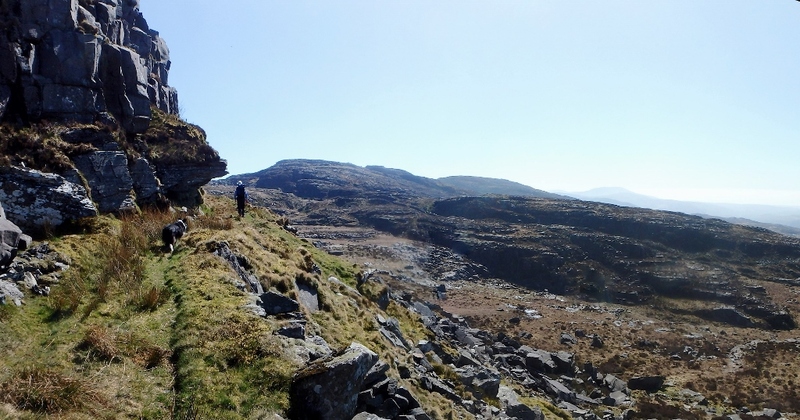 The Rhinogs can be a bit gnarly in places, but the route from Rhinog Fach south along the ridgeline is brilliant! 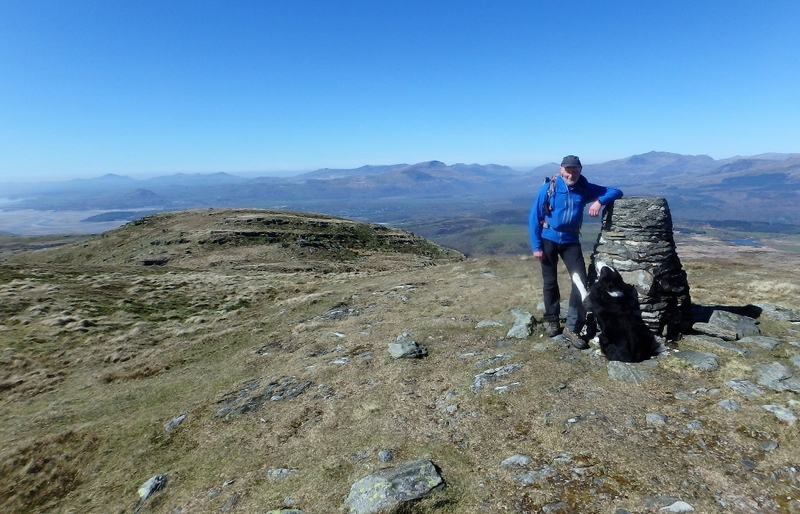 That’s the one I describe in post #96 – if you get good weather for that you will love it! You had a beautiful day out, Paul. I assume this was earlier this month in the extraordinary warm April weather. 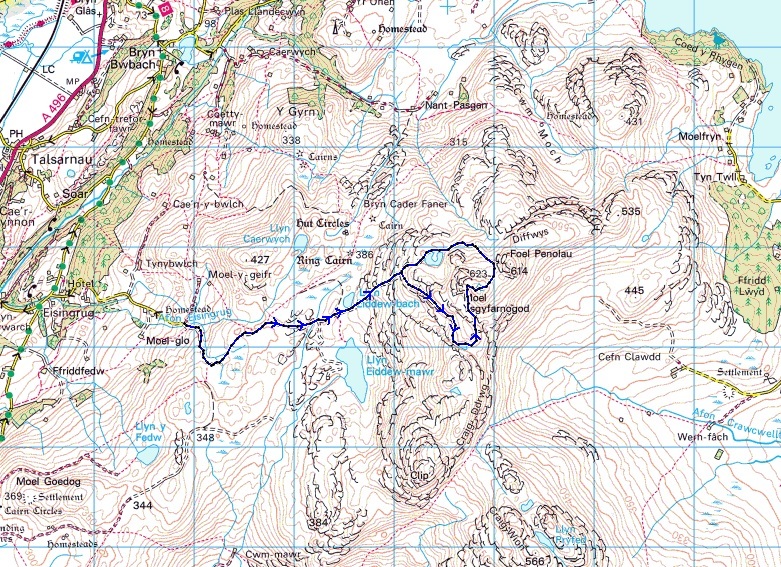 I walked the Rhinogs range north to south many years ago with a bunch of lads from Liverpool who I had met on Skye. It started out misty and was wet all day. By the time we reached Barmouth we were like a bunch of drowned rats and the ‘Waterproofs’ proved to be a lie! Yes Andy, it was that lovely spring weather we had a couple of weeks back, alas a memory now! some very interesting rock formations there! and what a mouthful of a name. 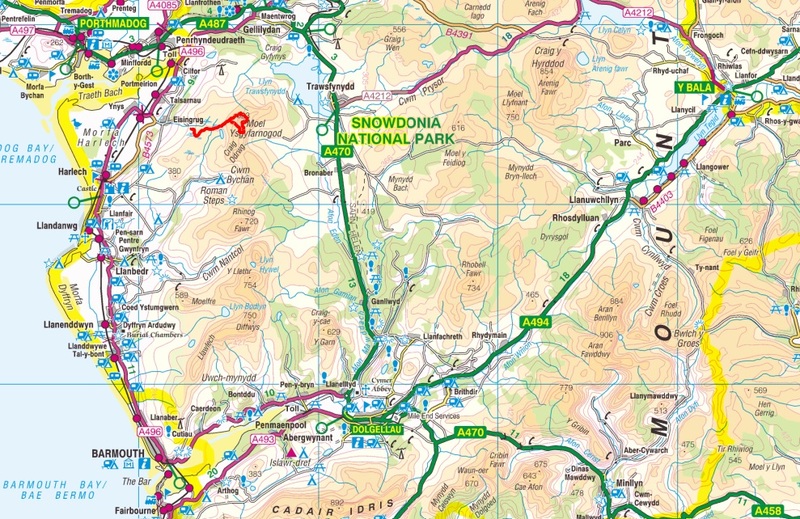 The whole area is a bit weird, but in a good way – must go back soon!